The Kettler is made to withstand the outdoors and we found that to be true! This surface technology combined with the weatherproof sealed aluminum composite top makes this the perfect outdoor table. When storing, the swiveling wheels, anti-tilt trolley and a locking mechanism allow for easy handing by one person. This German-made game tables surface guarantees maximum protection with an aluminum apron that prevents table warping and designed with a tournament line along its surface for an even smoother and even playing surface. 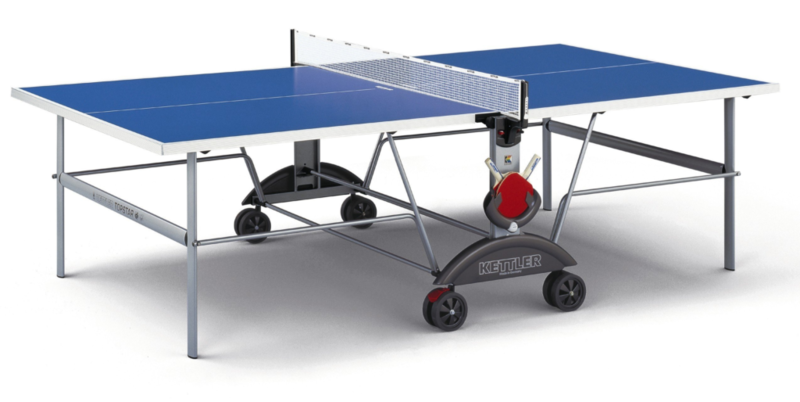 Kettlers table tennis top features an aluminum composite coated with UV scratch and fade resistant water-based paint for added durability. Also, ALU-TEC climate control underside, Kettlers patented technology, protects the table against different weather conditions. Dimensions: 108 L x 60 W x 30 H inches / Weight: 121 pounds. 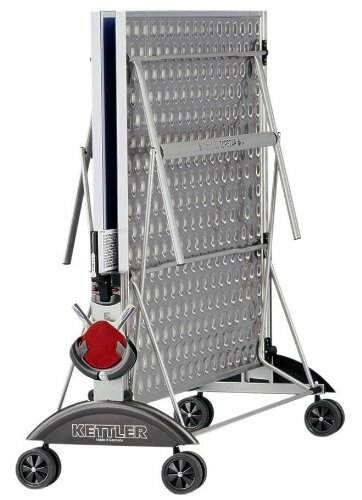 Construction is top of the line on the Kettler Topstar XL table. We like the weatherproof 7/8″ tabletop that features the ALU-TEC underside with Climate-Control technology. The Ultra smooth, anti-reflective and certified TRUE BOUNCE tournament top is just what you want outdoors. It holds up well to the weather conditions and there is not much glare when playing in the sunshine. We will say the Cornilleau 500M and Cornilleau 250S provide better anti-glare technology on their tables, but again they are much more expensive. We find that many outdoor surfaces just aren’t as level as those you find indoors and that is one important aspect this tables lacks – it has no leg levels which is a bit confounding as almost all outdoor tables come with this feature. 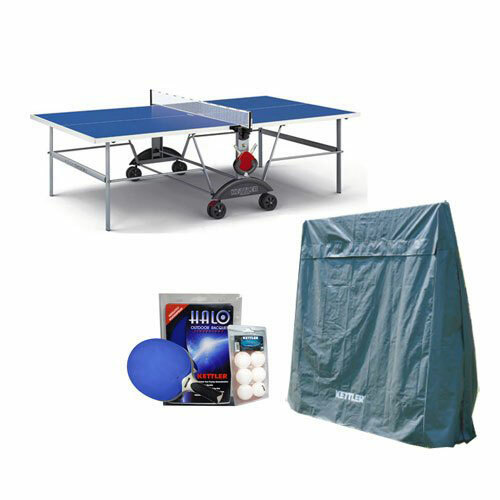 On one side there is storage for paddles and balls and the net stays attached to the table at all times, so it will remain in place even during storage mode. With the few features this ping pong table lacks, we still like the value. At around $800 dollars this table will hold up and provide your whole family years of fun. Your product will arrive with all the necessary parts, without defect and/or shipping damage. Well ship new replacement parts or an entirely new table for free. If you still arent satisfied, well give you a full refund. All our items ship for free to your door, but we also offer in-home delivery and assembly for an added fee. Warranty: 3-Year Residential/1-Year Commercial Warranty. Repair or replacement is available during this period at no cost to the purchaser.